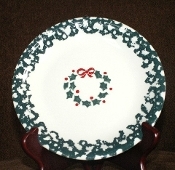 Vintage from Paul is pleased to offer these simply marvelous Tienshan Folkcraft Holiday Pines Wreath Dessert Plates. This pattern features a green sponged design set against a creamy background and as the focal point, in the center of the plate is a lovely and seasonal green wreath accented with red berries. Each of the available Tienshan Folkcraft Holiday Pines Wreath Dessert Plate is in MINT Condition with no chips, cracks, scratches, or other defects/flaws. The colors are vibrant, the graphics crisp. The bottom of the pieces are marked with; " Folk Craft TM,Holiday Pines by Tienshan, Made in China"
The Tienshan Folkcraft Holiday Pines Wreath Dessert Plates measure 7-5/8 inches in diameter.